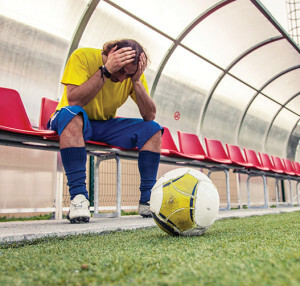 A lack of confidence and fear of reinjury after anterior cruciate ligament (ACL) reconstruction is keeping some athletes from returning to play, according to several abstracts presented last month at the American Physical Therapy Association’s 2013 Combined Sections Meeting (CSM) in San Diego. Despite successful surgical outcomes, many athletes never regain preinjury levels of play, but psychology may help explain this discrepancy, said researcher Trevor Lentz, PT, SCS, CSCS, of the University of Florida Orthopaedics and Shands Sports Medicine Institute in Gainesville. Lentz and colleagues tested knee function in 80 athletes six months post-ACL reconstruction. Participants also reported pain levels and completed the International Knee Documentation Committee Subjective Knee Evaluation Form (IKDC), Tampa Scale for Kinesiophobia (TSK), and the Knee Activity Self-Efficacy (KASE) Questionnaire. At six-month data collection, these 12 individuals had greater anterior knee laxity, a lower IKDC score, and poorer function on the TSK and KASE scores compared with participants who returned to sport at one year. The 12 also had poorer TSK and KASE scores than the 26 participants who identified an alternate reason for not returning to sports. Lentz’s study was done in the lab of University of Florida Associate Professor of Physical Therapy Terese L. Chmielewski, PhD. Chmielewski headed a study presented at the CSM that found patients’ fear of reinjury and self-efficacy after ACL reconstruction change over time. Thirty four postreconstruction patients completed the TSK and KASE at three points after surgery: their second physical therapy session (baseline), three months, and six months. She noted that current rehabilitation programs may be more effective at increasing confidence than decreasing fear. “It also appears that fear may be accentuated when patients begin advanced rehabilitation and return to sports, maybe because people start doing activities that make them fearful,” she said. Early identification and intervention may be key to improving outcomes for these patients, and investigators are still evaluating tools used to measure psychological issues, Chmielewski said. “The recently developed ACL-RSI (return to sport index) combines several psychosocial constructs into a single form. It will be important to determine whether it’s more beneficial to administer a single questionnaire with several psychosocial constructs or test different psycho­social constructs separately,” Chmielewski said. Missoula, compared the utility of the IKDC to the ACL-RSI, which quan­tifies emotional response to injury, confidence in the operated knee, and patients’ perception of reinjury risk. He evaluated quadriceps and hamstring strength and functional performance in 23 physically active individuals one to four years post-ACL reconstruction. The IKDC showed no significant correlation with the outcome measures, while the ACL-RSI had significant correlation with quadriceps (but not hamstring) strength and other functional measures. injury/lack of confidence. Presented at the American Physical Therapy Association Combined Sections Meeting; San Diego, CA; January 2013. Chmielewski TL, Herder B, Lentz TA, et al. Fear of movement/re-injury and activity self-efficacy in early and late phases of ACL reconstruction rehabilitation. Presented at the American Physical Therapy Association Combined Sections Meeting; San Diego, CA; January 2013. Mizner RL, Mahlum BT. Clinical utility of an injury-specific psychological survey for long-term ACL reconstruction outcomes. Presented at the American Physical Therapy Association Combined Sections Meeting; San Diego, CA; January 2013.